Victoria has retained its position as Australia's top economy for a third straight quarter, with NSW vying for the pole position, topping a number of key economic indicators. 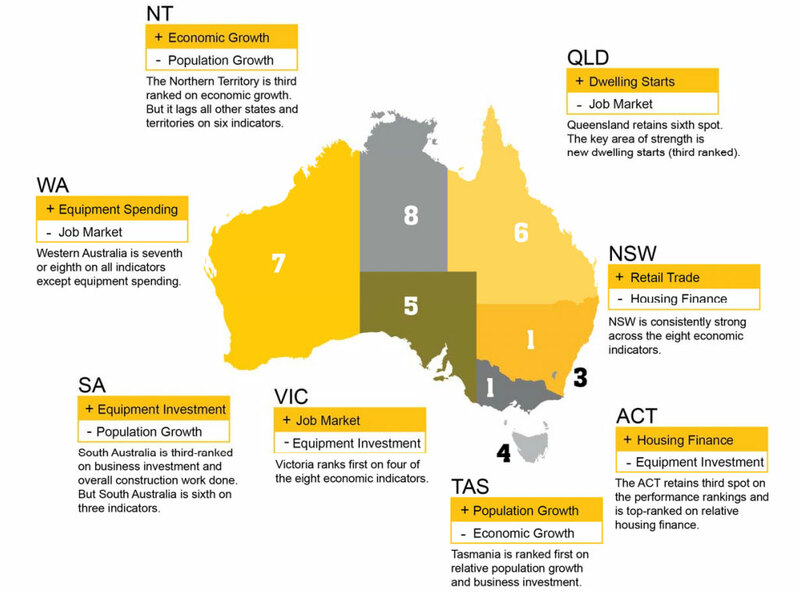 The results are part of CommSec’s quarterly State of the States report which ranks Australia’s states and territories according to eight economic indicators. The report analyses the current rates of economic growth, retail spending, equipment investment, unemployment, construction work done, population growth, housing finance and dwelling commencements to score each state. 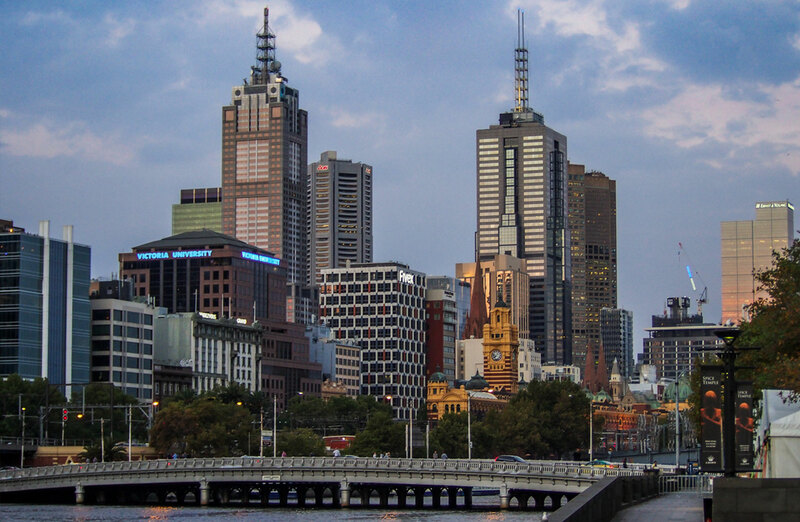 Victoria muscled its way to Australia's leading economy mid-year last-year, claiming top spot for the first time since CommSec began rating the relative performance of the states a decade ago. The state's long standing commitment to property development, housing-starts and new infrastructure bolstered its position, while benefiting from solid population growth, strong job markets, retail spending and business investment. In the latest edition of the standings, Victoria has ranked first in terms of economic growth, retail trade, unemployment and construction work done, while NSW remained consistently strong across the board and was second placed on six indicators. The ACT retains third spot on the performance rankings with strength, due to the building and purchase of new homes. Tasmania is in fourth spot with a lift in population growth, driving new home construction and business investment. At the other end of the scale, the Northern Territory fell into eighth place, just below Western Australia. Both face challenges with the transition of resources projects from the construction to the export phase. Victoria remains at the top of the economic growth performance ranking, closely followed by NSW. The state’s nominal gross state product is now valued at $413.5 billion over the quarter, a 26.6 per cent increase compared with the decade average, edging NSW which collected $532.3 billion, a 25.4 per cent increase. The weakest nominal annual growth rates are in Northern Territory down by 5.6 per cent and Queensland up 4.2 per cent. Tasmania marked the strongest on the pace of economic growth, seeing its economy lift by 6.9 per cent over the year to September. The state also led on relative population growth (relative to its normal performance) and business investment, and placed second for housing finance commitments. There has been just one change in the rankings with South Australia lifting from sixth to fourth position. While the ACT remains in top spot, with the number of commitments up by 32.8 per cent on the long-term average, the Northern Territory has the weakest annual comparison with trend home loan commitments down 11.7 per cent on a year ago. Home building remains strong in the ACT with dwelling starts up 87.3 per cent on a year ago to record highs. Experts have forecast at least $1 billion of building work will be carried out across Canberra annually for the next three years with approximately 9,000 new residents arriving in the Australian capital each year. Consistent sky-high prices in Sydney has also pushed many Sydney-siders to look for a more affordable options north of the boarder. Queensland's dwelling starts have strengthened, now sitting third nationally, with starts up 20 per cent on decade average. CommSec reported that in five of the states and territories, construction work in the June quarter was higher than the decade average. Victoria has retained top spot with construction work done recording $13.9 billion and sitting 38.2 per cent above its decade average. NSW construction was next strongest completing $16.7 billion in construction, 34.5 per cent above the “norm ” or decade-average followed by South Australia up 19.5 per cent recording $3.1 billion. Three economies had construction work lower than a year ago (up from two in the June quarter) led by the Northern Territory with construction down by 44.1 per cent. In Western Australian construction was down by 6.1 per cent on a year ago followed by Queensland, down 1.2 per cent. Consistent with recent figures showing an increase in business investment, in the September quarter five states and territories also had equipment spending above decade-average levels.